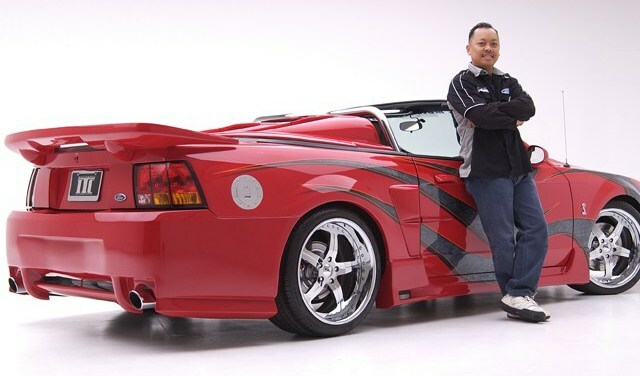 Ivan Tampi Customs is Ivan’s come back venture since leaving the aftermarket auto industry in the mid 2000’s. Showcasing his latest line of carbon fiber creations named XIK (pronounced sick) are solely invented, designed and developed by him. After the initial release of his 15 Parts Limited Edition XIK Wide-body kit in carbon Fiber for the C7 Corvette Stingrays Ivan has launched a complete range of outstanding auto restyling products to beef things up. His designs have changed the game in restyling for C7 Corvette Stingray’s, Z06 & the new ZR1. ITC is focused on designing and manufacturing aftermarket carbon fiber product lines for all American muscle cars such as Corvettes, Mustangs and Camaro’s. Ivan Tampi has been involved in the aftermarket auto industry for more than 20 years. His designs have won many Awards and numerous Car Show Events. Ivan Tampi was well known for his infamous body kit design called “Black Widow” series, predominantly for the Japanese made cars, Honda and Toyota. The Black Widow body kit has been distributed to consumers from all over the world ranging from USA, Canada, UK, Japan, Australia, France and Belgium. He later decided to maneuver his talents to the American car industry and created the Black Widow Ford Mustang body kit. Impressed by Ivan’s creativity, Ford Motors gave Ivan two project cars to build, the Ford Focus and Ford F-150 to design a body kit design to promote their latest model vehicles. That year Ivan’s design won Ford Choice Awards at the SEMA convention. Ivan Tampi is a self-taught automotive designer, composite and fabricator talent. He started out in the mid 90’s creating his very first front bumper design in his garage while living in his parent’s attic in Los Angeles California. He named the new design The Street Fyghter! Spelled with the Y. This design was such a hit for the Honda Civic that he went on to make a series II naming it The Street Fyghter II. From there he decided to design and create a complete bodykit, which would include a front, sides, rear and wing for the Honda’s. Ivan named and trademarked it to become the Black Widow & Black Widow II series. The BW design was so impressive among the Honda’s car clubs and shows that it became the biggest selling kit throughout the late 90’s and 2000’s. Ivan then used the success of his Black Widow kit to move into the Ford Mustang market, once this was released on his Cobra, Ivan’s bodykit business would completely explode turning over 2 million dollars in yearly sales at the young age of 33. His company Ground Designs 2000 was a house hold name in the industry and the number one supplier of the most sort after body kits in the aftermarket import industry, but it was later cut short when aftermarket speed shops wanted a big piece of the pie! Dozens of companies came on board as wholesalers of Ivan’s fast selling kits only to splash mold his parts re manufacture them and sell them as authentic GD 2000 designs and under cut him on his own product more than 50% of the retail price! They had started not only a price war but dozens of infringement cases as well. Ivan had all the copyrights to his images, though every single one of them were being stolen and used in national auto magazines, websites, and used as marketing materials. He had trademarks, registered design patents on the bodykit parts and all of them were being infringed on, but nothing would stop the greed from spreading to dozens of speed shops. After a handful of lawsuits and settlements GD 2000 was financially exhausted. Sales had dropped 60-70% due to the sales of fake Black Widow bodykits, accessory car shop owners would rename the Black Widow design as the Spyder kit and continue to sell the infringed body kit for years. Unfortunately, the year 2006 GD 2000 closed its doors for good. Ivan has been involved in the aftermarket auto industry for more than 19 years. His designs won many Best of Show Awards in numerous Car Show Events and multiple auto conventions. The Black Widow body kit was distributed to consumers from all over the world ranging from USA, Canada, UK, Japan, Australia, France and Belgium. When he decided to maneuver his talents to the American muscle car industry and create the Black Widow Ford Mustang body kit, Ford Motors took notice and was impressed by Ivan’s creativity. Ford Motors gave two project cars for him to build and market. The first one was the Ford Focus and Ford F-150. Ivan would create a body kit design to help promote their latest model vehicles. His Ford Focus design won Ford Choice Awards at the SEMA convention in 2003. After closing down and with a recession kicking in Ivan was out of the car industry for about 7 years but not for good. In the summer of 2013 he completed his wide body kit design for the BMW Z4 and debut it at the 2014 SEMA Convention. It was overwhelming over looked with thousands of attendees passing it by with absolutely zero interest. It became very clear to Ivan that 2014 was not the year for the BMW Z4 but it was the year for the new model of the Chevy Corvette’s Z06 and Stingray! While walking the SEMA convention Ivan took note of some new Corvette feature vehicles with wide body kits and said to himself, “This is right up my alley, it’s what I’m known for since my 1988 CRX Wide Body Limited Edition design” It got featured in 9 National Aftermarket Auto Magazines and 6 of them were covers! Ivan got straight to work! He started on his renderings now he just needed a Corvette! He partnered up with longtime friend Bob Matias and formed a new company Ivan Tampi Customs. ITC purchased a brand new 2016 Shark Grey Stingray in September 2015, Ivan had less than 4 weeks to turn his renderings into his wide body kit design and make it to SEMA, the largest aftermarket auto trade convention in the world! No longer were the days of eye balling the measurements for Ivan’s kits. He wanted it made in Carbon Fiber with accuracy and precision! With the new technology, we knew it is possible. We sourced the materials and technology needed to make Ivan’s new wide body Corvette design, and with Ivan hard at work on the physical aspects it was all coming together perfectly. He had to make the plugs plus make the parts and pull the stock Corvette bumpers off and install his new design all while shaping and perfecting the fit, put all the trimmings, bolts etc., get it painted and get it to Las Vegas all in one piece! All this hard work was to be accomplished by him and only him! No crew, no team, just Ivan and his magic hands! Ivan Tampi Customs debut the XIK Wide Body Kit at the 2015 SEMA Las Vegas show as a feature vehicle.